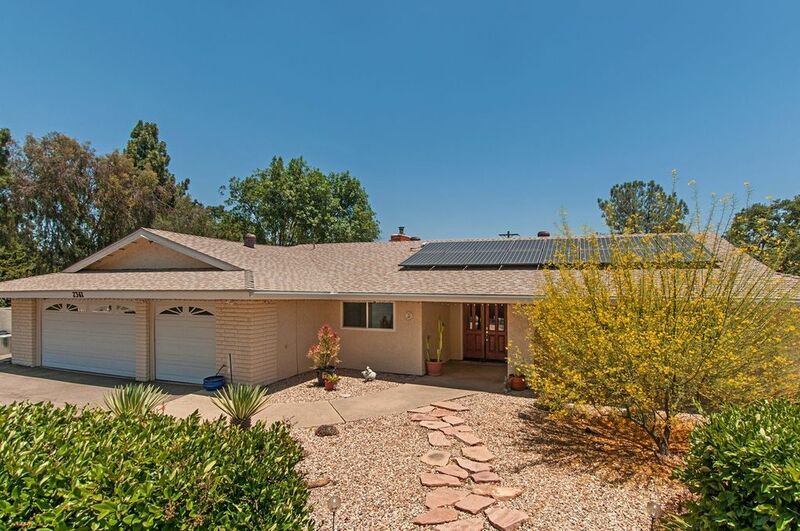 Beautiful single story ranch style home on 1.35 acres at the end of a cul-de-sac. This home has 2,307 sq. ft., 4 bedrooms plus library/office, & spacious master bedroom with walk-in closet. Bathrooms have been nicely upgraded. Sliding doors from master and family room lead out onto a large covered patio. The kitchen has solid surface countertops, convection oven, warming drawer & opens up to the family room. Beautiful landscaping thoughtfully done using drought tolerant plants. Solar is owned. see supp You can sit in the spa and watch TV, have a nice evening BBQ dinner and then sit around the fire and gaze at the stars. There is plenty of parking inside the private wrought iron gate plus the 3 car garage. There is also a tall outbuilding with alley access that is big enough for a motorhome or toys. There are fruit trees and plenty of space for animals if you wish. Directions To Property: 8 East to Tavern Rd. exit turn Right on Tavern Rd. After approx. 1.4 miles turn Right on South Grade. Left on Alpine Heights Rd Left on Grace Lane. End of cul-de-sac.